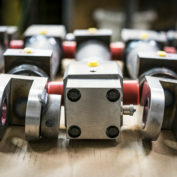 We partner with our customers to design, engineer, and build custom hydraulic cylinders that work best for their specific application and industry. A tradition of craftsmanship, engineering excellence, quality control, and on-time delivery is included with all of our hydraulic cylinder products. Our ISO 9901:2008 Certified Standards ensure that each cylinder is manufactured to exacting specifications developed jointly between our Sales, Engineering, and Quality departments – and you, our Customer. In addition, every cylinder is individually inspected and tested before leaving our plant to not only meet but hopefully exceed your expectations. We have been ISO 9001:2008 Certified since 2004 and continually invest in our equipment and capabilities, with ongoing training for our most important asset – our people. This ensures that quality is built into each and every component of the hydraulic cylinders we manufacture. The team at Columbus Hydraulics will work alongside you as an extension of “your” Design and Engineering team to create a solution which is robust, high quality, and fine-tuned for optimal performance. We want to understand your application as well as you do! As a full-service supplier, our team will be there for support from start to finish and will ensure a smooth launch into production, with dedicated ongoing support into the future. Our sales and engineering staff will work with you to become an extension of your team. We will be there for support from start to finish for new or ongoing projects. We will work with you from the early design phase and application engineering and approvals through production and field support for the life of the product. At Columbus Hydraulics, we offer a wide variety of cylinder design options and custom features to fit any need.